Company: Belkin Product: Ultimate Keyboard Case Price: $129.00 Compatibility: iPad Air Website: www.belkin.com Date: March 24, 2014 Belkin’s Ultimate Keyboard Case is a smart keyboard folio for the iPad Air that combines some of the best features of two of its rival products, ZAGG’s ZAGGKeys Folio Keyboard and Logitech’s FabricSkin Keyboard Folio for the iPad Air. You can pick up the Bluetooth-connected case for $129 from Belkin, but is keyboard folio worth the price? 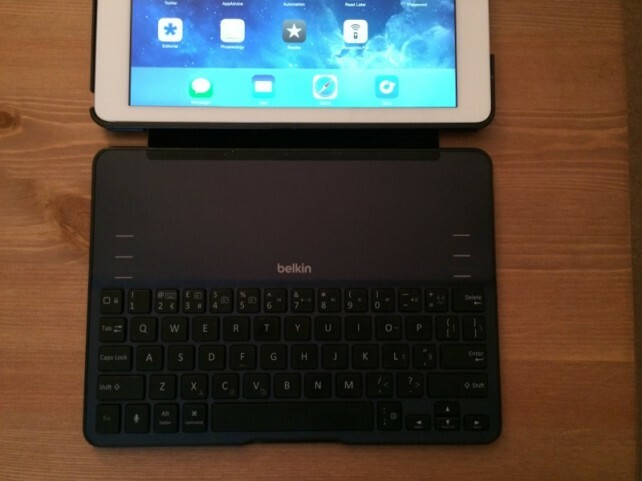 Belkin’s Ultimate Keyboard Case consists of a Bluetooth keyboard and a plastic iPad Air frame, which are connected together by a piece of rubber-like material. 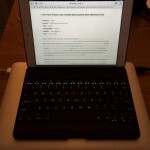 In order to use the keyboard, you must clip your iPad into its plastic frame and then prop it upright: the bottom of the case is magnetized, as are three defined points along the top of the keyboard. When the iPad frame touches one of these three points, it’ll attach magnetically, thereby securing the iPad Air in place. The three magnetized points means that users can prop their iPad Air up at three different viewing angles, and though the range offered isn’t as great as ZAGG’s ZAGGKeys Folio for iPad Air, I was able to easily choose a viewing angle that I liked. 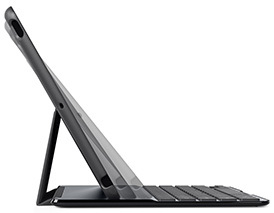 What’s clever, though, is that Belkin’s Ultimate Keyboard Case triggers the Bluetooth keyboard when the iPad Air frame is magnetically “clipped” onto the case in this way, meaning users don’t need to flip a button on and off whenever they start and stop using the keyboard. I found this to be incredibly useful, and in the long run it helped preserve the case’s battery life, too (since the keyboard ultimately spends less time remaining accidentally switched on). You can charge the Ultimate Keyboard Case up using a micro-USB cable, and Belkin promises 264 hours of active battery life. I can vouch for this: during my testing, I used the case to work for around 12 hours each day, and it lasted for weeks on a single charge. Alongside the micro-USB port on the right-hand side of the case is a small LED Bluetooth indicator light, and it’s worth adding the Belkin includes a USB to micro-USB cable with the case. The main difference between the Ultimate Keyboard Case and the ZAGGKeys Keyboard Folio, though, is that Belkin’s product offers a highly usable keyboard for Apple’s iPad Air while still allowing users to easily pick up and use the tablet as a tablet. 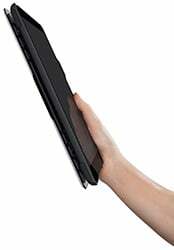 This is because you can lift and fold the keyboard part of the case back and behind the iPad Air without having to remove the tablet from its frame, allowing users to go between the two modes quickly and easily. While testing the case, I found myself frequently doing this, and for me it’s a killer feature that puts Belkin’s product ahead of ZAGG’s. Of course, you can also close the case up in order to carry your iPad in-hand or in a bag, which is something we’d expect of any such product. Typing on an iPad keyboard folio is never going to feel the same as typing on a MacBook – at least not to begin with. 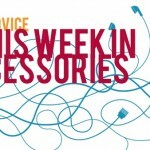 But I adapted to using Belkin’s case in no time at all; the keys are solid and a selection of iOS-specific shortcuts makes navigating through Appe’s mobile OS quick and easy, though unlike the ZAGGKeys Folio, the keys aren’t backlit. Overall, I’m really pleased with Belkin’s Ultimate Keyboard Case, mainly because it provides a highly usable keyboard that can easily be folded around the back of one’s iPad. Because of this, it’s the iPad Air keyboard I’d choose. 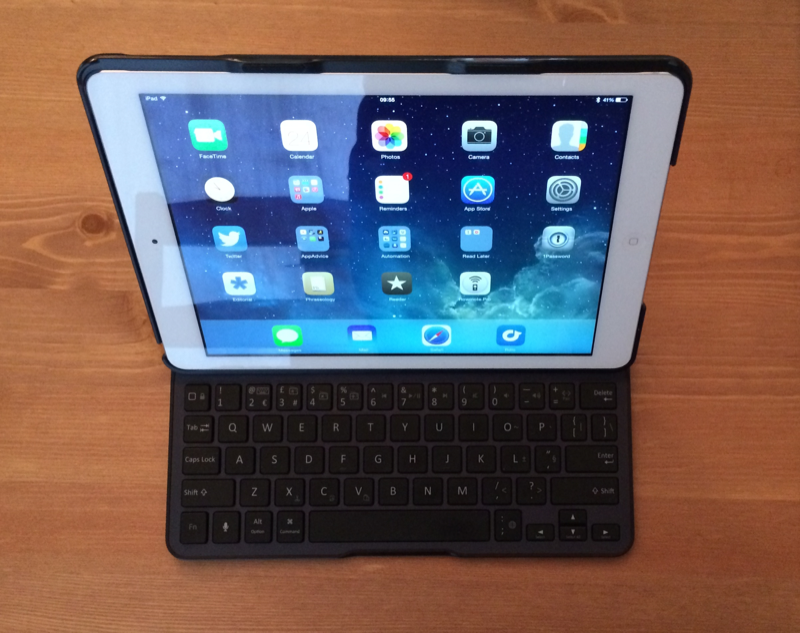 Backlit keys might be absent from this keyboard, but it’s nevertheless the iPad Air keyboard I’d choose. Though costly, Belkin’s Ultimate Keyboard Case could help turn your iPad Air into a device you use more often; we think it’s a great product and it comes highly recommended.